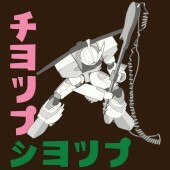 You know, there’s something about seeing a Gundam going all London Calling on a guitar that brings massive amounts of joy to my bitter little heart. I’m sure it has something to do with the fact that I spent most of my teenage years obsessing over both The Clash and giant, city crushing robots. Now I’m not fully aware of the crossover potential between anime and punk rock — but I guess if someone’s making a tee with hefty hat tips to both cultures, it must exist. I mean, it has to, right? Thanks for the post brother. We would stop making icon tees if they would stop selling and if they weren’t so much freaking fun to make. We try to do at least 3 illustration designs internally plus guest artist work and then do another icon trio. Its pretty much one trio a year and since we are a small shop, we only manage about 10-20 designs a year. Hoping to get more artists in there for 2010 and have about 3 planned right now for FEB/MAR.